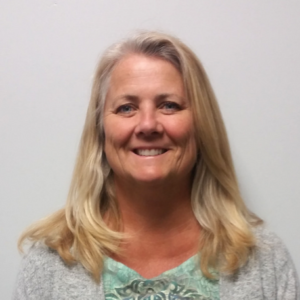 Help At Your Door is pleased to welcome Dawn Germscheid to the team as Finance Director. Dawn Germscheid has more than 30 years of extensive accounting and finance experience in both private and nonprofit sectors. Her experience includes business development, financial system creation and implementation, general ledger accounting, administration, operations and all aspects of non-profit reporting and compliance. Prior to joining Help at Your Door, Dawn worked for more than 11 years in the non-profit sector in leadership roles. These included Director of Finance and Operations at The Bridge for Youth, Finance Director Consultant for MAP for Non Profits and the Director of Finance and Administration for Wayside House. During these roles she oversaw the operation of the Accounting, Administration, Facility Management, Human Resources and IT Departments. Dawn is a graduate of Northeast Wisconsin College with a degree in Accounting. She is an active member of the Non Profit Finance Group – Twin Cities. Interested in staying up-to-date about what’s going on this spring at Help At Your Door? 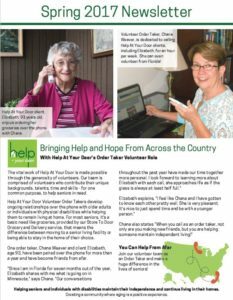 Take a look at our latest newsletter for information about volunteer group opportunities, ways that our Handyman Services will help seniors with tasks around the home this spring, and “Save-the-dates” for two upcoming events in celebration of Older American’s Month this May. Sign up for our e-newsletter and we will make sure to keep you ‘in the know’ with client and volunteer stories, updates and more information about our services! 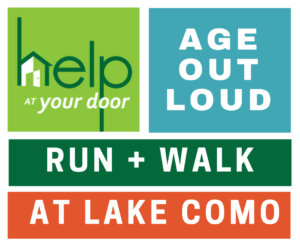 Show your support for Help At Your Door and older adults in your community at our “Age Out Loud” Run and Walk Event. On May 6, 2017, bring your families and your grandmas and grandpas to meet at the registration booth near the parking lot of Lake Como’s Lakeside Pavilion. This is a free event, but make sure to check-in to enter to win prizes. Registration begins at 9:00 a.m. and we will kick off the running and walking at 9:30 a.m. This all age walk is a fun chance to join together as volunteers, caregivers and supporters to raise awareness about community aging. At the end of the run and walk, stick around for snacks and fun activities. You can even walk a little further and spend some time at the Como Zoo! Join us for a “fun run” and a good cause.